Right … time to slay the demons…. !!!! Stop shouting at the legs and get out there and ride. Today’s exercise is – ride a slower pace but longer distance. Weather is still pretty awful but its hard adding to the mileage total if you are not actually on the bike. A little jaunt out into the Surrey hills, taking in Staple lane and the countryside nearby. Actually starting to feel much better on the bike and the legs are starting to work again. Felt pretty happy making it up Staple Lane without blowing up and even managed to keep the legs spinning on the return route. 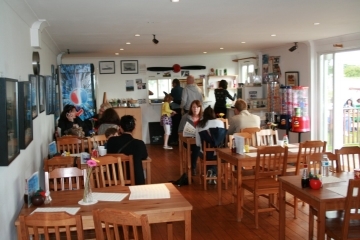 Had a bit of an energy fade nearer the end so a small detour to the Hanger Cafe was in order for the obligatory coffee and cake. Ride out with the newcomers…. So back to basics, today. 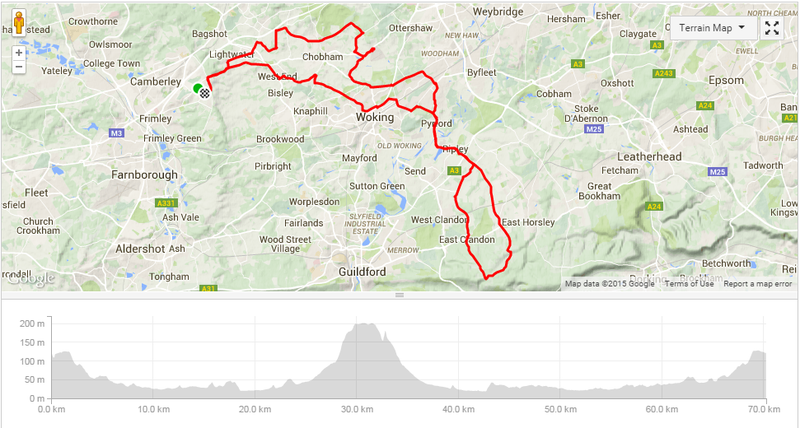 A ride out with the Woking CC newcomers. !! 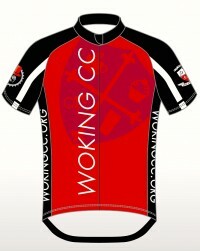 Woking CC runs a introduction ride for people who are just starting out. Turn up on whatever machine you have and we do a very gentle ride out around the local lanes with the usual coffee and cake. My plan was to “help out” and do my usual back marker role of helping if anyone has a problem. My actual plan was to see if I can hang on and get round. Was great to meet up with Julian (who was leading the ride) and was good to get out and cycle in a group after my last solo efforts. I think I managed to hide the fact I was blowing up the hills and had legs like lead for most of it. 35KM at a very gentle pace. – slowly slowly catchee monkey. First ride out… ouch ! I spent the weekend giving the bike a once over. Brakes / Gears / Chain all got an overhaul. Gave it a good clean and sprayed everything that moved with oil. Thought about spraying my legs to see if that would speed them up but its a bit of a pain to get off and it makes the hair on my legs a bit greasy. It was a typical grey February but it wasn’t raining and not much wind so the first chance to get out. The plan was to keep it nice and local (just in case the bike gets a fault) So off I set with enough layers on I must have taken up the whole road with the width of me. Well after 2 km I was shouting “shut up legs” and fighting the urge to chuck the bike in a ditch and take up a proper sport like “darts” or “chess”. Still I limped on and tried a local hill. Lets just say I didn’t bust any Strava records !!! and was probably the most painful thing I had done since stuffing myself with mince pies on Christmas day. A pitiful 23 KM which felt harder than last years Ridelondon’s 160km OUCH !! Well its 2015 and whats been going on I hear you ask.. Yes I am still on the bike, a year older and balder and fatter. In February the magazine arrives on the doorstep. 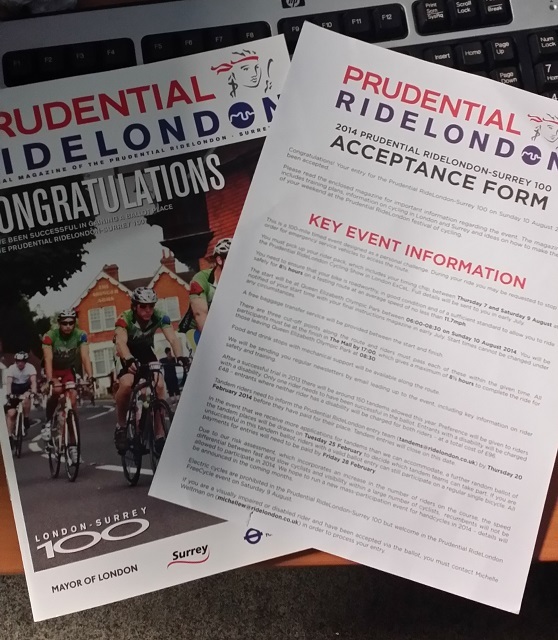 telling me I have a place in the 2015 Ridelondon ballot. Oh deep joy, another painful year of getting my legs ready for the big one. The adventure starts here again – and it feels like I am starting from scratch.